Cameroonian soldiers ‘invaded’ a medical facility as they hunted Anglophone separatists in the country’s troubled northwest region. The attack took place on Feb. 17, in the Diocese of Kumbo, which has been plagued by the fighting between the army and rebels. The Shisong Cardiac Center at St. Elizabeth Catholic General hospital is the only facility where heart diseases are treated in Central Africa. The soldiers stormed the building searching for separatist fighters. “It is giving us a very bad name,” said Bishop George Nkuo. “The army can come in to the hospital where there are cardiac patients and move around in search of whomever. It is not done; but that was done. And they shoot around even with people who are cardiac patients. That is the most irresponsible act to do. Most unprofessional I would say at the least,” he told Crux. A local Catholic radio station in the area, Radio Evangelum gave details on how the military assault was conducted. “About 11 a.m. that Sunday, defense forces of Cameroon got into the premises of Saint Elizabeth Catholic General Hospital and Cardiac Centre, Shisong. It is alleged that they were in search of wounded separatist fighters who might have been admitted in the hospital,” the station reported. “Five military men, carrying arms, entered the hospital through the gate leading into the Farewell Home. They moved into the Cardiac Centre section of the hospital next to the Farewell Home. The soldiers, reports say, went into the wards in that section, and took out a boy who was taking care of his grandmother admitted in the hospital. They proceeded to the inner sections of the hospital, went to the Surgical Unit, and moved into one of the wards. The soldiers are said to have fired some gunshots inside the hospital premises,” the report continued. The station said the Tertiary Sisters of Saint Francis who run the hospital were on a day of recollection that Sunday, but some of the sisters immediately came to the hospital where they met the soldiers. The nuns told the soldiers to stop their disruptive actions and to leave. The soldiers complied, and released one young man they had detained. “The likelihood of trauma on patients and health workers is high. The effect of the incident on patients in the Cardiac Center section could be disastrous and long lasting. The administration of the hospital was uncomfortable with the incident,” said Sister Mary Aldrine Kinyuy, the director of the hospital. The incident happened just a day after separatists kidnapped over 100 students from a Catholic school in the diocese. They were released the next day. Nkuo said Kumbo has recently become a theater for conflict, with people being killed, homes burnt and property destroyed. Separatists have also been accused of atrocities, and have attacked Cameroonian security forces, and kidnapped opponents for ransom. “There is shooting and random killing,” the bishop said. He said much of the killing is carried out by government soldiers, whom he accuses of acting unprofessionally. “I have seen houses burnt and I am even told that there are a number of people being killed… And the people who have been killed are innocent people, innocent civilians. I am very sad indeed,” Nkuo said. “I can tell you that people are living in great fear. I have had the chance to go round the diocese, to go on pastoral visits, in fact today (Feb. 17), I was in one of the parishes and three-quarters of the people have left. They are not there. They have left. I can even say that some of them have threatened they would never come back,“ the bishop added. “The bishop cannot leave them. I am there with them because somebody must be there to reassure them that there is hope, that there is a future and that God is in control. That is why I am still in Kumbo,” he said. Recently, a picture of the bishop went viral after it showed him carrying a box on his head while visiting a remote village in November. “I don’t know why it went viral. I am sorry about that,” he said, before noting that he was just doing what he ought to do as a pastor in the circumstance. “If I have to go and meet the people and the road is blocked, what should I do? Should I stay back? No! This is what the missionary does and this is what we should do. We must go to meet the people even when we meet obstacles, we must be humble enough, we must show a sense of mission that we can overcome the obstacles and go to where the people are,” Nkuo said. He acknowledged the fact that he has not been able to reach all his parishes, but insisted that wherever possible, he would go. “God, the Church expects us to do that and we do it joyfully and happily because we know that the people of God need us and we must go there and attend to them,“ the bishop explained. Bishop Michael Bibi, Auxiliary Bishop of Bamenda, Cameroon, visited Portsmouth and celebrated Mass on Sunday 20 January at St John’s Cathedral in a break during a visit to Rome. Catholic schools in Portsmouth diocese are encouraged to twin with schools in Cameroon. Bamenda is a major centre in the English speaking region of Cameroon whose schools and legal system have been disadvantaged by the government dominated by French speakers tending to impose the use of French. A majority of the region’s population support a separatist movement which has engaged in acts of violence including recently the deaths of two priests and a seminarian. Some counter terrorist activity by security forces has led to civilian deaths. There have been kidnappings of school children, not just Catholics but also from a Presbyterian school. Bishop Bibi himself was kidnapped and released on two consecutive days in early December while driving from town to town on church business. The President of Cameroon Paul Biya, aged 85, has been in power since 1982 and shows no sign of standing down. The country suffers from terrorism by Boko Haram, a group connected with Al Qaeda, the need to back the government’s efforts to combat which seems a priority for help from the UK although some assistance is given to displaced people. Bishop Michael said the atmosphere in Bamenda alternates between normality and tension. Sometimes there are road blocks. Mondays in the English speaking region are the days for “ghost towns” when many people observe a general strike; more extreme separatists threaten violence against those who do not take part. Some homes have been burnt down. 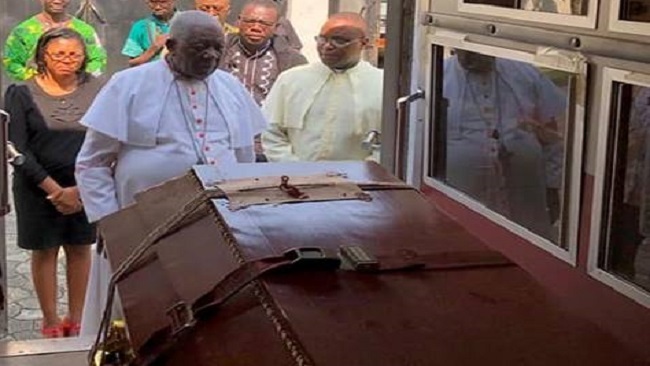 Cameroonian Christians are crying out against the ongoing violence in their country, where churches are being converted into military barracks and believers are forced to flee. “We need peace and the United Nations intervention,” a Methodist Christian, whose identity wasn’t revealed, told Protestant Digital. “They look tired and psychologically tortured,” said Fonki Samuel Forba, moderator of the country’s Presbyterian Church. The Presbyterian school said that it will close due to concerns over safety. American missionary Charles Wesco was killed late in October when he was caught in “crossfire” between the Cameroon army and English-speaking separatist forces, the U.S. government said. In October, on the occasion of a community bank holiday, Forba declared in a statement: “Given what the English-speaking community is going through at this time, we cannot have a celebration while many of God’s children are being killed, suffering or living as internal or external refugees.